My proselytizing here is of a political rather than religious nature. It isn’t the divine figure of Christ I am interested in but the purely historical Jesus, a radical Mediterranean Jewish peasant building a revolutionary movement two millennia ago. Jesus of Nazareth was an activist, and, judging by the two-thousand year duration and global spread of his message and movement, a very good one. He was successful, in part, because he approached activism and organizing creatively. 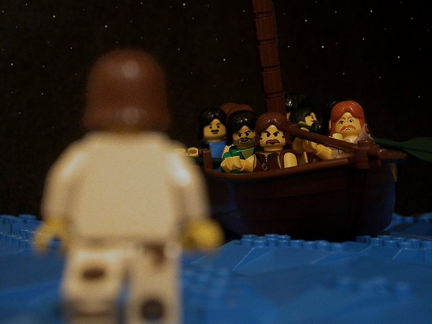 Jesus understood the fundamentals of using story and spectacle, signs and symbols as means to criticize the status quo and offer up an alternative vision. When Jesus entered the main temple of Jerusalem and overturned the tables of the money changers and sellers of ritual objects he was staging an effective political performance. He could have stood outside and harangued the passerby with his opinions, the ancient equivalent of the activist on the soapbox, but instead he demonstrated his politics though a spectacular act of civil disobedience. Through such an action he not only demonstrated visually and bodily his political ideals, but did it in such a provocative way that news of his deed, and therefore his message, was sure to travel. 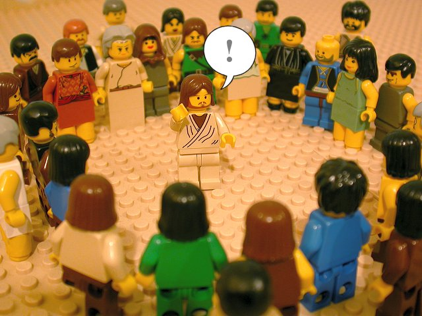 In modern parlance: Jesus went viral. Consider next Jesus’ use of parables and how, by employing these often oblique stories, he created an opening for his audience to make the message their own. Unlike a list of grievances or demands, easily understood and just as easily ignored, the parables asked listeners to puzzle through the mystery of the stories and their meanings. It was an “invitational form of speech” to quote the Bible scholar Marcus Borg, that does not command, but instead works in its “ability to involve and affect the imagination.” One can almost imagine the scene following an impromptu teaching of Jesus: people walking away, debating amongst themselves exactly what this crazy holy man meant by comparing the kingdom of heaven to a mustard seed. But with every argument and counter-argument, Jesus’ words ceased to be his alone and became the common property of his audience. “Render unto Caesar the things that are Caesar’s and to God the things that are God’s.” Jesus’ crafty reply to the question of whether it was okay to refuse to pay taxes to the ruling Roman Empire, posed by officials trying to trick him into uttering treasonous remarks, has been used to justify the separation of Church and State for millennia. This orthodox interpretation serves liberal secularists who would like to keep religion at arms length from their government and conservative Bible-thumpers looking to justify their distaste for the secular state, but this reading completely misses the radicalism of Jesus’ reply. He was not simply making the case that religion and politics occupy different realms, he was arguing for a re-framing of reality whereby Empire might be rejected, not on their terms: paying or not paying taxes, but by creating and enacting an entirely different way of seeing, being and making meaning that refused to acknowledge their authority. To borrow a phrase from the aesthetic philosopher Jacques Rancière, Jesus was calling for a “re-distribution of the sensible.”  Furthermore, Jesus was shifting the political terrain from the material, where poor people like himself are always out-gunned, to the cultural: the traditional weapon of the weak. To do this cultural re-calibration of reality, Jesus understood that it was not enough to merely criticize the way things are (as this, perversely, reinforces the status quo by re-centering what is) but what was needed instead were new models for the way that things might be; “an aesthetic anticipation of the future,” to quote Rancière once more. Finally, by accepting and even embracing his own execution, Jesus refused to do for his followers what they needed to do for themselves. By removing himself from the scene at the very moment when both his friends and enemies demanded that he lead, Jesus put responsibility and ownership back upon his followers, letting them know that if the world is to be changed then they we will have to be the ones changing it. 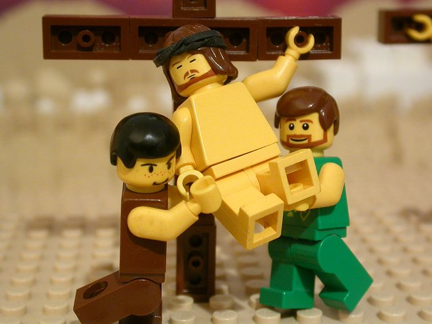 Alas, this is not the interpretation of the crucifixion that has persevered. The Christian church, in its effort to stabilize his radical message and institutionalize his authority, transformed Jesus’ de-centering sacrifice into an act of guilt-inducing aggrandizement. There’s a good lesson here for activists about the elasticity of symbols and the dangers of co-optation, but I think Jesus was trying to impart an even more valuable one. Jesus didn’t “die for our sins,” far from it: he died so we would have to act (and perhaps sin) on our own. His message was not: “I do this for you” but instead “You need to Do-It-Yourself.” For activists interested in building a truly democratic society, one in which all people have the capacity to lead, this may be his most important lesson of all. By making Jesus out to be a radical activist I acknowledge I am treading on heretical ground. In attributing the success of Jesus’ message and movement to his creative acumen, and not his supposed divinity, I might reasonably be accused of religious heresy. And my claim that a religious figure like Jesus has something to teach worldly activists can be considered politically heretical. Religious heresy I willingly confess — mea culpa — but the charge of political heresy I’ll contest, as I believe progressive, secular, creative activism is in desparate need of reformation. Religious figures and symbols make many in activist and artistic circles uneasy, and I readily admit that there’s much to condemn in religion: its bigotry and intolerance for starters. But we lose out when we summarily dismiss all that is religious. 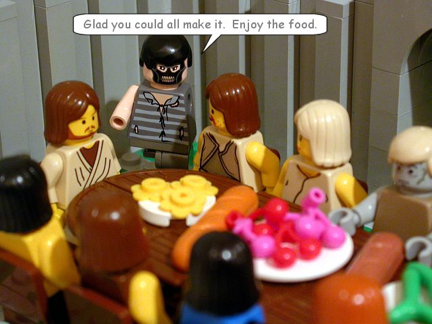 Religion, as a compendium of stories, a system of ethics, and a model of behavior can be drawn upon as a popular alternative to norms and ideals of competitive consumer capitalism, and most religions also extol such virtues as love, community and responsibility for others: good material for an astute organizer to work with. Refusing to engage with the signs and symbols, visions and spectacles that have motivated people for millennia is simply bad activism. Jesus is an example that many people, particularly many non-political people, or people whose politics are in need of changing, can relate to and thus learn from. And if Jesus as an activist exemplar alienates non-Christians, there’s other religious figures to draw upon for lessons and inspiration; Moses, Muhammad, and Buddha were also well versed in creative strategies for winning hearts and minds. The first rule of guerilla warfare it to know your terrain and use it to your advantage. Whether we approve of it or not religion forms the contours of a majority of people’s life and consciousness; it is a, if not the, lingua franca used to imagine how life could and should be different. To be an effective activist you need to be able to talk the talk, even if you are uneasy walking the walk, and in today’s world that may mean asking yourself, as a creative activist, What Would Jesus Do? 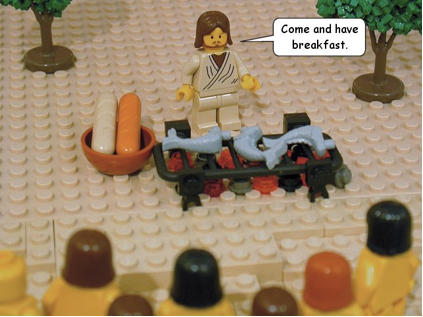 Note on illustrations: All illustrations come from The Brick Testament http://www.thebricktestament.com/ the permissions page can be found at http://www.thebricktestament.com/faq/index.html. Marcus J. Borg, Meeting Jesus Again for the First Time: The Historical Jesus and the Heart of Contemporary Faith, New York: HarperCollins, 1995, p. 74. Further elaborating on the political power of the parables and aphorisms Jesus was fond of using, Borg writes: “As evocative forms of speech they tease the imagination into activity, suggest more than they say, and incite a transformation in perception.” . 2. John Dominic Crossan, The Historical Jesus: The Life of a Mediterranean Jewish Peasant San Francisco: HarperSanFrancisco, 1992; Jesus: A Revolutionary Biography San Francisco: HarperSanFrancisco, 1995. 3. Stephen Duncombe, Dream: Re-Imagining Progressive Politics in an Age of Fantasy, New York: New Press, 2007. 4. For more on the radicalism of Jesus’ reply see Terry Eagleton, Reason, Faith and Revolution: Reflections on the God Debate, New Haven: Yale University Press, 2010. 5. Jacques Rancière, The Politics of Aesthetics, London: Continuum, 2004, p. 13. 6. James C. Scott, Weapons of the Weak: Everyday Forms of Peasant Resistance, New Haven: Yale University Press, 1985. 8. Borg; Crossan, The Historical Jesus.